GUS POYET has targeted “two or three” wins before the end of 2014 after yet another draw from Sunderland. The Black Cats finished all-square for the eighth time this season after a stalemate - their fifth of the campaign at Liverpool today. Until the introduction of Steven Gerrard midway through the second half, Sunderland were on top at Anfield, yet couldn’t convert that possession advantage into a goal. That has been a common theme for Sunderland this season, but Poyet is looking to change the pattern over the next four games against West Ham, Newcastle, Hull and Aston Villa. Poyet said: “We wanted to play better with the ball, have a bit more play. “I think in the first half, we were much better than the last three or four games. “We’re just missing that cutting edge; the difference up front. The one who is going to score the goal and make you win games. “But the rest of the game, we were very good. “We’ll keep working. In the Premier League, getting three points is massive. 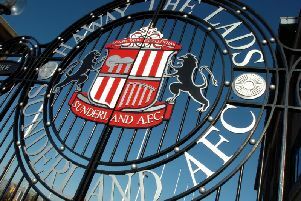 Boosting Sunderland’s attacking threat is likely to be the club’s priority in the January transfer window and Poyet admits that is one solution to their goal return. Poyet added: “We’ve got two options. Keep working, find solutions and how you can be better in the final third - cross from better situations. “Get players like Adam Johnson or Ricky Alvarez higher up the pitch one v one against the defender. “Or do we buy a striker? “But those players are expensive.